The latest JurassicCollectables video to be posted is a review of the spectacular “Crimson King”, the Rebor Carnotaurus (C. sastrei), 1:35 scale dinosaur model. Rebor has continued to set the standard when it comes to 1:35 scale Theropods and this new Carnotaurus joins Acrocanthosaurus, Ceratosaurus, Yutyrannus, Utahraptor, T. rex, Velociraptor and Deinonychus in the Rebor replica range. In this short review, (the video lasts a fraction over six minutes), viewers are given the opportunity to have a really good look at this skilfully modelled South American dinosaur. The narrator discusses various aspects of this dinosaur model. For example, he points out the care and attention to detail revealed by the sculpted roof of the mouth and that amazing coloured tongue. The articulated jaw and front limbs are demonstrated and the lava field base is also shown and commented upon. When the fossilised remains of a single, individual specimen was discovered in the mid 1980’s, palaeontologists were very puzzled. This Theropod from Argentina, was unlike any other dinosaur that scientists had described at the time. It ended up being assigned to its own family, the Abelisauridae, along with Abelisaurus (A. comahuensis). The skin impressions, found in association with the Carnotaurus specimen, provided the researchers with some of the best-preserved dinosaur skin samples that had been discovered. The blunt snout and the thin lower jaw suggested that this dinosaur had a unique hunting strategy. The skull seemed too lightly built to cope with struggling prey, however, at an estimated eight metres in length, Carnotaurus was very probably an apex predator, although it can’t be ruled out that this dinosaur was a specialised scavenger, relying on the kills of other dinosaurs. In the JurassicCollectables video, the Rebor Tenontosaurus corpse (Ceryneian Hind) is used to provide scale for the figure. The genus name was erected as this dinosaur has two prominent horns above its eyes. These horns stuck out sideways and reminded the scientists of the horns of a cow. It is not known what these horns were for, it has been speculated that they could have shown maturity, or perhaps they played a role in visual displays. Another theory put forward is that these horns protected the eyes during intraspecific combat. 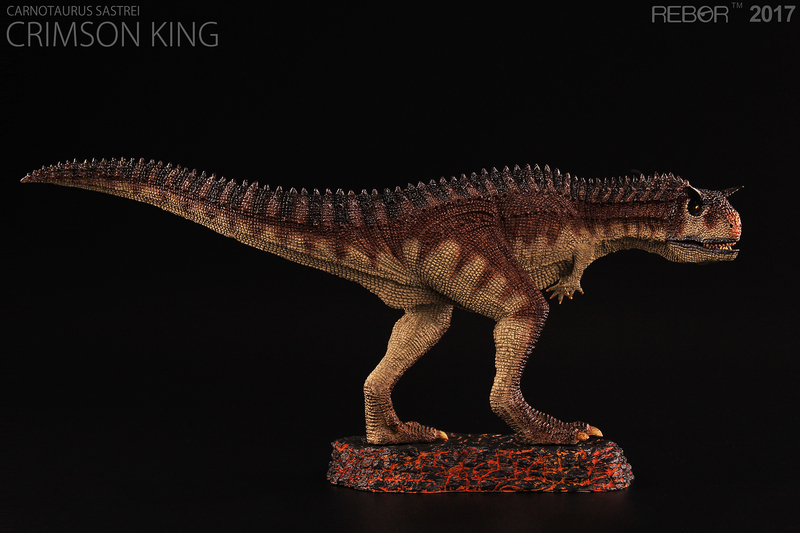 Rebor “Crimson King” Carnotaurus dinosaur model. The very informative JurassicCollectables video review also features the Papo Brown Tyrannosaurus rex model (standing T. rex figure), this replica is also used to provide scale and the Rebor Carnotaurus works very well alongside this Papo model. Look out for “off colour Alan”, who makes his regular appearance. A JurassicCollectables dinosaur model review would not be complete without an appearance of this figure! JurassicCollectables have a wonderful YouTube channel stuffed full of prehistoric animal model reviews and other very informative videos, including reviews of the Rebor Acrocanthosaurus replica and the Rebor Cerberus Clan (Deinonychus dinosaurs). Visit the YouTube channel of Jurassic Collectables here: JurassicCollectables on YouTube , don’t forget to subscribe to the JurassicCollectables channel, after all, some 55,000 dinosaur and prehistoric animal model fans already have!